Drawn by Jimmy and Larry Price of Melrose, this map depicts the Melrose area when it was known as Banana. 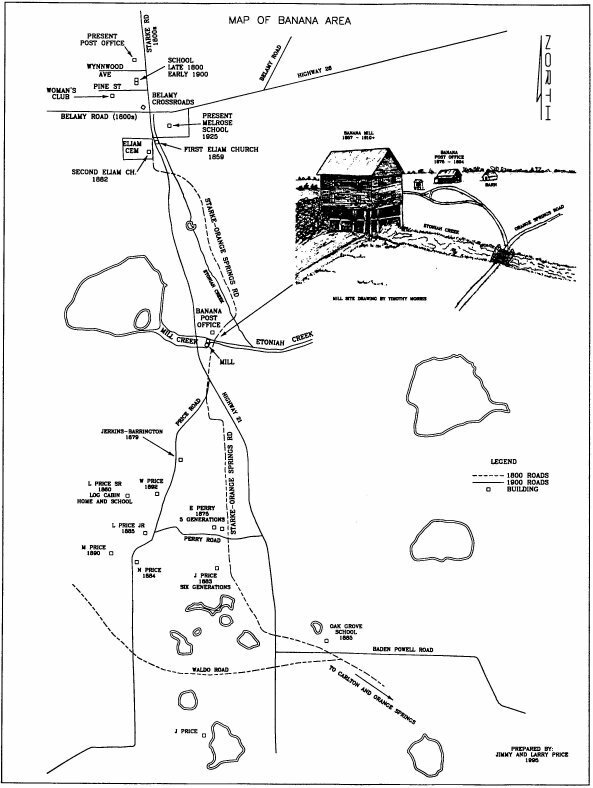 Locations of several homesteads are included. Mill drawing is by Timothy Morris. An enlarged version of the map is available for viewing. Please be patient while downloading, as it is a large file. Laban and Sarah Price came to Putnam County from Marion County, SC in the late 1850's or early 1860's. They had nine children, including William, Laban, Murchison, Nathan, and John. Their daughter, Susie J. Price, married Emery B. Perry. Jimmy Price is a decendent of Laban and Sarah. Thanks to Bob Franks for the county graphics. Photos of the county courthouse, the Putnam House Hotel and Benjamin Putnam courtesy of the Florida Photographic Collection.